Okay, this may seem odd to put on a booze blog, but I have yet to meet a serious fan of the grain and grape to not also have an enormous affection for the greatest Arabic invention of all time: Coffee! I’ve been roasting and grinding the stuff for almost 40 years. (Dear God! I’m older than the planets!) I make no claims to being the best coffee connoisseur in the world, but I have a better base knowledge of the stuff than average. If you’re curious I make, almost exclusively, filtered coffee in a Melitta pot, hand ground via a Hario grinder. My bean of choice, purchased green, is Ethiopian Yrgacheffe. I’ve fooled around with other systems, notably the Chemex. The Melitta filters are easily available, and I like the notion of using unbleached paper. I REALLY like hand grinding, mostly because I detest the whine of machine grinders first thing in the morning. 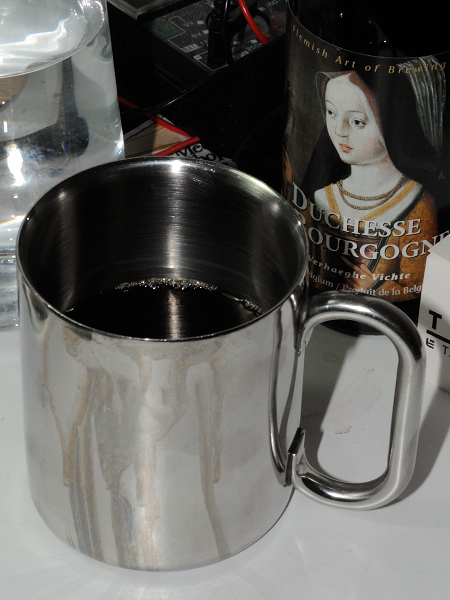 Also – and you will either have to try this yourself or just assume I’m a (hand) crank – it tastes different and I think “better.” I used to use German hand grinders but they disappeared for a few years from the N. American market. I found the Hario about a year ago. I use the clear grinder with the vacuum base and can’t recommend it highly enough. Also the Hario has replaceable parts though at this price I’ll likely just buy another when the burrs show signs of wear. 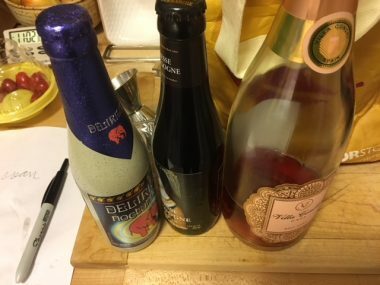 Anyway, whether you aspire to my middlebrow level of coffee making, or wish to go higher I wrote this post to share a blog I discovered. Mr. Piotr Jezewski offers regular reviews, great insights including quantifiable measures. (And I think quant tasting is badly needed throughout the food and beverage industry.) The guy and his blog are brilliant! If you want to know about the ultimate cup of coffee, and the ultimate tools to take you there, check him out. For the record, I’ve never met him, don’t know anything about him other than his posts and I doubt he has any idea I exist. No Christmas Eve would be complete without a glass of real egg nog, not that horrid stuff you buy by the carton. As I said on the air today, I make this for myself using half the sugar, and skim milk. Dial in the variables to suit yourself. Also shaved dark chocolate on top is a nice touch. As is Fee Bros. Mint Bitters. 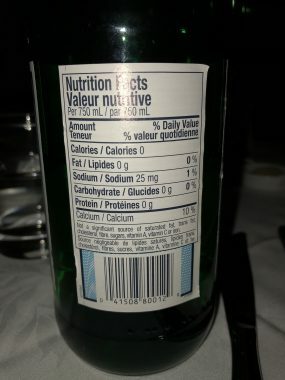 The “Low Cal” and singeton version. People as about the calories for the original recipe, somewhere between 1500 – 1600 total, call it 400 a serving. If you substitute 10%BF cream you save about 70 calories a serving. 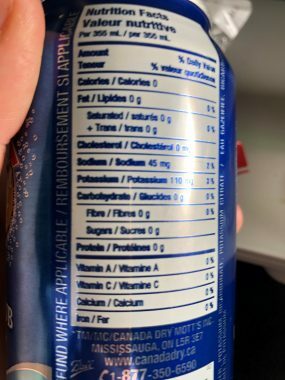 If you use skim you save over 100 per serving. CORRECTION: I previously said the wine was aged in red oak casks. I was wrong. There was some confusion over the casks, which are white oak, French, previously used to finish Gretzky’s Merlot, Cabernet Franc and Sauviginon. 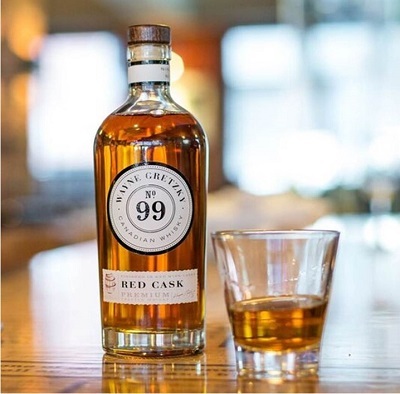 Gretzky has just launched a whisky. And I’m here to say, it’s a pretty good one. But it is also deeply interesting from a technical point of view. Traditionally wine and whisky are aged in white oak – Quercus Alba in America, Q. robur primarily in France – casks, charred to a greater or lesser degree on the inside. American made barrels are flat sawn, exposing more grain and therefore more of the lactones in the wood to the spirit or wine so stored. French oak is split. Some Spanish coopers import Q. Alba logs and split them for use in Spain. The costs of inventory to age whisky are staggering. Wine Barriques currently cost about $1000 each. They hold 225 litres more or less. About 12-100 MILLION bottles of scotch are sold annually. There are an estimated 20 million barrels in storage at any given time. Distillers are removing age statements as quickly as they can to cut costs. Recently researchers have discovered a method involving temperature and UV light which they claim can age whisky in a matter of months, maybe days. Micro-distillers in Canada are speculating that the massive temperature swings on the prairies (about 80 degrees C/176 F) will age whiskies here abnormally fast. Gretzky’s distillery stores the casks in non temperature controlled warehouses. Interestingly they too claim the massive temperature swing of the Canadian climate speeds aging. I tasted No. 99 alongside a Gibson’s Finest yesterday. The whisky was notably darker in colour, likely due to the oaking. The bouquet did have some ethyl acetate aromas that cleared off fast, a couple of seconds in the glass. It was surprisingly smooth. with a nice finish. It would make a nice base for your favourite Canadian cocktail. I expect it will work well in a sweet Manhattan. Maybe even in a dry Manhattan. Personally I’d drink it with a single cube, but I’m a horrid sinner who grew up in a curling rink, so pay no attention to my tastes. Here’s the latest limited release from Ardbeg a thoroughly modern Scotch for the New World Order. Firstly, no age statement. Judging by the pale colour of the whisky I assume it is between 6 and 10 years. Distilleries are increasingly edging away from the traditional statement of age on the bottles. This if you haven’t been paying attention has been going on for at least a decade. It is driven mostly by a need to keep whisky in the distribution pipeline. The stuff is now so universally popular the production is not fast enough to support ten years in a barrel. Secondly, the choice of barrels. This is the first whisky I’ve sipped, which to my knowledge hasn’t seen time in a used Bourbon barrel, the traditional aging vessel. The reasons are the same as the last paragraph. Cooperages in the US are hard pressed to keep up with the demand from bourbon distilleries, who in their turn are still dwarfed by the massive needs of say a Glenlivet or Johnnie Walker. Instead the barrels are from the Circassian Hill country of the Adghye Republic. There is some back story to the oaks involved here which I haven’t tracked down yet. They may be particularly tight ringed old oaks, but I don’t know. In any event they’re Q. robur, the species made famous by the French in wine barrels. Okay so what does it taste like? The nose is full of seaweed, iodine and smoke meats? Say what? There is a definite aroma of smoked or roasted or barbecued meat there. The box claims bacon, which I think is a bit off, but over to you for comment. 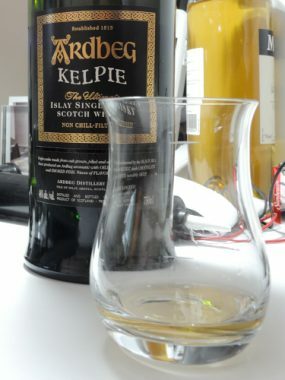 I found the palate to be peaty, full of the sea and surprisingly herbaceous. Definite chocolate/earth there, with some fruits. A surprisingly delicate whisky given the powerful peaty nose. And for the nerds in the audience, a Kelpie isn’t an Australian sheep dog but a sea monster (also a fresh water monster, but in Scotland that difference can be slight.) It usually had the front of a horse and the rear of a sturgeon. Sometimes the horse was a bull. Supposedly the creatures could take on the shape of a human to lure you to your watery end. Their give away was hair tangled with seaweed. 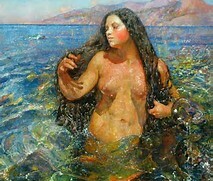 The pre-Raphelites preferred painting nubile young women (and who can blame them? ), and gave Kelpie something of a siren spin.